This month, Vance and I threw together our first family cookbook. It's scheduled to arrive this Tuesday from Blurb, and I am probably disproportionately excited about it. When the Fed Ex guy rings the doorbell I imagine myself running full sprint through the office, knocking over whoever might be in the way, to get to the door first. Imagine what I'll do when I actually write a "real" cookbook! I've already started thinking about next year's edition. I want each of the recipes to be an original, which is a huge undertaking for me. I'm very comfortable following someone else's instructions, knowing it was good enough when they made it to publish in a book or magazine; it's another thing entirely for me to conjure a recipe on my own. I'm also planning to make it more seasonal and locally oriented, featuring whatever happens to be growing around us at the time. With all that in mind, I present to you the first recipe for the 2011 Kite Cafe cookbook. I shall call this "the one that made me feel better about that lobster mac 'n cheese." Or, "the one that takes more calories to prepare than it does to burn off" (okay, maybe that's a bit of a stretch). Or how about, "the one that contained kale and didn't set off my gag reflex." I think I've really got something with that last one. 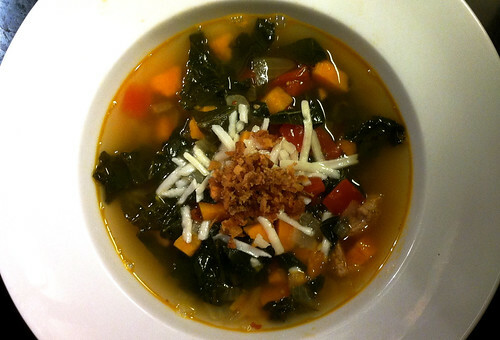 Serves 4-6 This recipe features locally grown kale, sweet potatoes, and tomato. If tomatoes aren't growing near you this type of year, you can skip them. They were just sitting on the counter, begging to be thrown into the soup last minute. Wash the kale. I like to do this in a water bath with a few splashes of white vinegar in a clean kitchen sink. It brightens the leaves and firms them up (especially if they've been in the fridge for a day or two). Heat the olive oil in a dutch oven over medium-high heat. Add the onion and saute, stirring occasionally for seven minutes. Add the garlic and sweet potato; stir to combine. Sprinkle generously with cracked pepper. Reduce heat to medium. While the vegetables are cooking away, de-stem your kale. Stack up all of the kale leaves and cut into thin ribbons, about 1/3 inch wide. 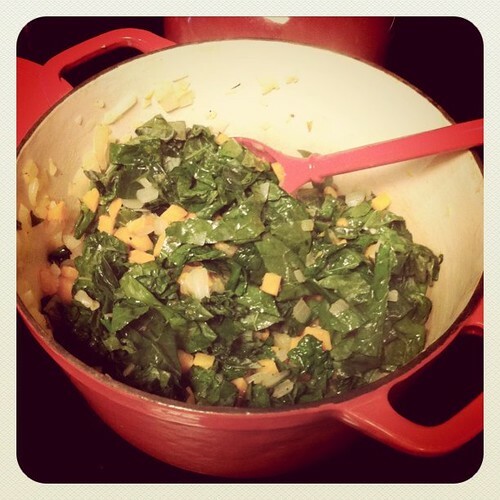 Add all of the kale to the pot; stir to combine. Add the wine and wait about 30 seconds, until the sizzling subsides. Stir in the water and stock.